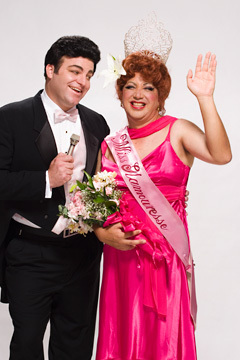 Keoki Kerr stars as Frankie Cavalier and Michael K. Pa'ekukui is Tawny Jo in "Pageant." OK, so Hawaii has seen variations of the "Boys Will Be Girls" cliché for years -- straight men with hairy armpits clowning around in dresses, and other men trying desperately to look like a "real girl." Randl Ask, director of Manoa Valley Theatre's "Pageant," says that although most of his all-male cast is in female attire, this isn't another gay bar review or drag show. » Times: 7:30 p.m. Wednesdays and Thursdays, 8 p.m. Fridays and Saturdays, and 4 p.m. Sundays, through July 23. "Drag historically is a venue of lip-synching and hard edges. It's kind of what the genre's about," Ask said. But Robert Longbottom, the creator of the original off-Broadway production, e-mailed Ask with a suggestion just before rehearsals began: "'Just keep them real, Randl, and you've got it made.' What he meant by that is that he wanted me to direct them with a 'less is more' approach." Ask was part of the workshop that created "Pageant" in 1990. He originated the role of Miss Bible Belt, one of six contestants vying to win the Glamouresse Annual Beauty Extravaganza. Speaking as someone who was there at the creation, Ask says "Pageant" doesn't need hairy armpits. "The script is so funny that if you continually add a layer of camp on top of it ... you begin to lose the luster of the script itself. It doesn't become 'real,' it comes a comment on the genre (of cross-dressing), which I didn't want to do." There isn't a hairy armpit, unwaxed eyebrow or hirsute back to be seen. "We're playing it real, as if these contestants are really vying for the title of Miss Glamouresse. For it to really land outside of a camp cross-dressing offering, the stakes need to be genuine." Why not just use women? "The men bring an objectivity to the women's beauty game that I think women in themselves have a hard time depicting because they're doing it (every day). The men are thrust into this world of being women, wearing three pairs of hose and corsets and brassieres and make-up and waxing and shaving. I had these guys shave their armpits, their chest, their back hair, their legs -- I made them shave it all to really get what women go through. I don't think that a woman would be able to bring clarity to the craziness of all that because they've been doing it since they were teenagers." The winner of the beauty pageant is determined by a panel of audience members who will pay $100, in addition to the regular ticket price, to be judges. This is the second time that MVT has staged "Pageant." Andrew Sakaguchi was director and choreographer in 1998 and is back to choreograph this production. Michael K. Pa'ekukui reprises the role of Miss Industrial Northeast. Daniel Kunkel (Miss Deep South), Chad Lovell (Miss West Coast), Colin Miyamoto (Miss Bible Belt), Christopher Obenchain (Miss Great Plains) and Don Richards (Miss Texas) complete the field of contestants. It might seem like market saturation to have "Pageant" follow Diamond Head Theatre's revival of "La Cage" and a recent show by the Giinko Maraschino drag troupe. Ask says his own performance as Albin in "La Cage" gave his cast something to work with when it came time to move beyond the drag-show aspects of "Pageant." "By these guys seeing my performance in 'La Cage,' they really understood that I was playing a whole person. I wasn't just doing one flamboyant take on somebody. I really wanted them to play a whole person, and you really get that (with this show). It's not about 'Look at me, I'm funny!' It's really about 'I'm really trying to win,' and it's very endearing, I think." Ask says the two shows offer very different experiences. "I think 'La Cage' has a very sad underbelly. ... There's an incredible joy to 'La Cage,' but also a sadness there. ... This show doesn't have that. There's no hidden message to the show, there's no agenda, there's just good comedy. It's old-style funny."